There is one less mystery in the deep sea: two Japanese researchers have finally photographed a live giant squid. It’s the first time one of the world’s largest cephalopods has been documented in its ocean home. “It is just a sensational accomplishment,” says Dr. Mark Norman, a leading squid expert who appears in NATURE’s Encountering Sea Monsters. The giant squid has long been the stuff of legend. Mariners claimed it sank ships and plucked sailors off decks. Even scientists admit it is a very mysterious creature. Dead specimens periodically wash up on beaches, but no researchers had ever seen one alive until recently. First image of a live giant squid, known as Architeuthis. Over the last decade, there’s been a race to change that. Some scientists have descended in submarines, hoping to catch a glimpse of one of the several known species of giant squid, which are believed to live in deep water, a thousand feet down or more, in oceans around the globe. Others have dragged camera-laden sleds across the ocean floor, hoping to take a portrait of one of these monsters, which are believed to grow up to 40 feet long. Two Japanese researchers, Tsunemi Kubodera of Tokyo’s National Science Museum and Kyoichi Mori of the Ogasawara Whale Watching Association, had a different idea. First, they identified an area where fishing boat captains and tourists had seen sperm whales with sucker marks on their skin, indicating a confrontation with the giant squid. They rode out to the spot on a Japanese fishing boat. 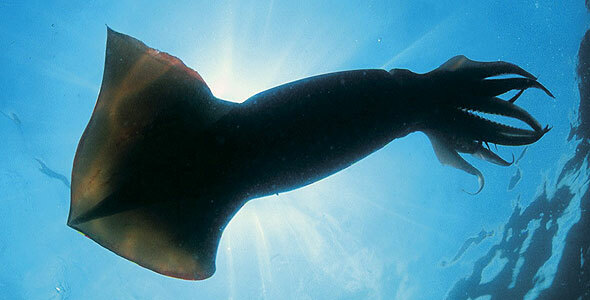 Then, they lowered a hook baited with a single small squid, nearly 3,000 feet down. Also attached to the line: an automated digital camera that snapped a picture every few minutes. The two squid hunters had little luck for years. Then, on September 30, 2004, in the waters off Japan’s Ogasawara Islands, they succeeded. 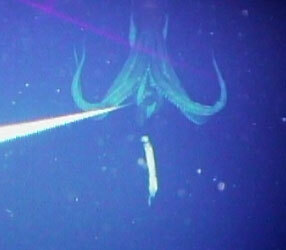 A squid about 25 feet long rose from the depths and took the bait. One of its arms got snagged on the hook. For more than four hours, it struggled to get free. Finally, the snagged tentacle broke off. By the time it was all over, the camera had snapped more than 500 pictures of the squid, which scientists call Architeuthis. When they pulled up the camera, the researchers retrieved the 5-foot-long tentacle tip as a souvenir. When Mori took it off the hook, he later told reporters, it was still moving. Its suckers even stuck on to the deck. The researchers studied their photos for more than a year, then publicly released them in a scientific journal in late 2005. The team explains that the photos show the squid hovering, “flying” through the water, and aggressively wrapping its tentacles around the bait. That suggests Architeuthis is “a much more active predator than previously suspected,” perhaps used to chasing and tracking down prey rather than waiting in ambush. The Japanese researchers “were extremely clever on every level,” says Dr. Norman, a senior curator at Museum Victoria in Australia. “My guess is that everyone is going to be breaking down their door and asking for help over the next few years.” He says the next step will be to get moving pictures of this and several other species of giant squid that live deep in the ocean.